The Nipissing high grade mill operated from 1911 until 1918, which the introduction of new processing methods at the low grade mill make the high grade mill obsolete. It is not known if the building was torn down or if, like so many others in the area, it burned down. 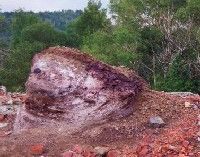 In the early 1990s there was still extensive debris around the site, include slag deposited along a steep slope just south of the mill, and two small piles of material on the foundation pad of an old building, beside the road to the low grade mill. The material is illustrated in the photo on the left, below. The origin of this material is not known, but samples collected in the early 1990s contained over 200,000 parts per million arsenic, or over 20% arsenic. Interestingly, this material also contained a mineral known as brassite [Mg(AsO3OH)·4(H2O)], which has not been found at any other location in Canada. Sometime in the late 1990s some of the debris was cleaned up around the high grade mill site, including the material described above. 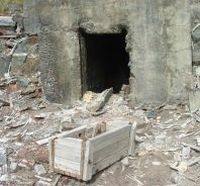 It is not known how this extremely arsenic rich material was disposed of. The material was located in the left foreground of the photo on the right, above. Despite the clean up to date, wood debris also remains around the site, raising the same potential concerns as those discussed regarding the wood on the Nipissing low grade mill tailings. In a screening level risk assessment completed by the Ontario Ministry of the Environment, data indicate there is extensive soil contamination around this site. Arsenic concentrations as high as 190,000 parts per million were recorded, and in 48 samples collected at the site, the provincial soil quality guidelines were exceeded in all samples by a factor of at least 25 times, and in 43 samples, the guidelines were exceeded by a factor of at least 100. In addition, many soil samples at the site were also contaminated with mercury, nickel and antimony. Downhill from the Nipissing high grade mill, in a small depression adjacent to the road along the east side of Cobalt Lake, and just north of a house, is a small deposit of tailings, contained by a low concrete dam with a small culvert in it. 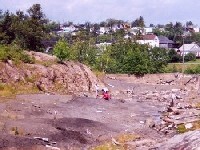 The origin of these tailings has not been confirmed, but they are assumed to be from the Nipissing high grade mill. 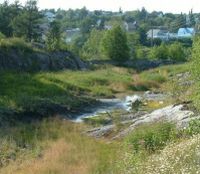 Sampling in the early 1990s indicated that these tailings contained some of the highest concentrations of arsenic in tailings in the Cobalt area, with one sample containing over 100,000 parts per million arsenic, or just over 10% arsenic. Water draining from these tailings into Cobalt Lake, just a short distance away, also contained some of the highest concentrations of arsenic in water in the Cobalt area. Concentrations in four samples collected in 1991 and 1992 were among the highest concentrations ever recorded anywhere in Canada, ranging from 9.98 to 22.0 parts per million. In the early 1990s these tailings were largely exposed. In 1996-1997 the tailings were revegetated as part of revegetation efforts in the area, and they are now largely vegetated. As small seasonal stream flows across the tailings, and some erosion of the tailings appears to be ongoing. Future monitoring in the area should include sampling of the water draining these tailings, to determine current arsenic concentrations in this water.